Now is Junior Reid’s time. He is seen daily worldwide on numerous features on music videos, and is currently one of the most requested reggae singers collaborating with mainstream hip hop and R and B artists. With two hit songs – “This is Why I’m Hot” with Mims, and “It’s OK – One Blood” with Game in top rotation on TV and on the radio, the younger generations know him. With video appearances in “We Taking Over”, “Like This” and “Too Much Blood a Run” with Inner Circle, Junior is constantly in the public eye. His new single, “More Money”, featuring Fat Joe is hot in the streets and he also has a popular mixed CD on the road called “Why I’m Hot.” When Junior recently broke out with, “This is Why I’m Hot” along with Mims and Babysham to 60,000 people at the Summer Jam in the Giants stadium in New Jersey, the fans went wild in uproar like he had just scored a winning goal. In his top billing this past February at the Bob Marley Day stadium shows in Long Beach and San Diego, Junior picked up the vibes of the shows dramatically. After a successful month-long tour April and May of 2005, Junior Reid, Andrew and Wada Blood and the Reggae Angels had a top performance at Reggae on the River, The Dreadstock Festival in Vallejo CA, and also the Rocktober festivals on four islands in Hawaii. A year later, in 2006 they embarked on a five week U.S., Mexico, and Canada tour of festivals and club dates including headlining the San Louis Obispo Slowmotion Fest, The Northwest World Reggae Festival, The Victoria Ska Festival on Vancouver Island British Columbia, Canada and The Monterey Bay Reggaefest. This was their fourth U.S. tour in three years. Junior has been blowing up all over Europe, Japan, America and South America. Junior has gotten a lot of attention for his worldwide hit single and music video with the hip hop artist Game- “It’s OK – One Blood” which was number one on MTV. Also his video appearance on Access Granted and his appearance on the Two Dollar Bill show with The Game, and The BET Hip Hop performance gained him heavy mainstream TV exposure. Also, he recently did The DJ Kally Birthday Bash in Miami with many of the same artists that did The BET Hip Hop award show. Junior Reid’s new album called “Junior One Blood Reid-Living Legend” is one of the most anticipated new releases on the horizon. Several of Reid’s hits such as “One Blood”, “Mashing Up the Earth”, “Fit ” and “This is Why I’m Hot” have risen to anthem status worldwide. Junior Reid first won the hearts of people around the world as the lead vocalist for Black Uhuru. Recently he has reached a whole new younger generation with his collaborations with Mims and Game. Junior Reid is a top class festival performer with athletic showmanship and melodic phrasing. His message inspires people from all walks of life and he remains a mentor to Rasta people worldwide. Junior is truly a man of the people – interacting vigorously with people from all walks of life. Opening for Junior are the messengers – The Reggae Angels. Within the last four years, the Reggae Angels completed a 50-city tour with Andrew Tosh (son of Reggae icon Peter Tosh), five extended tours with Junior Reid, two tours with the Abyssinians, a 9-week North America and Canada tour co-billing with Everton Blender, a California tour with Warrior King, and numerous Hawaii tours with Sugar Minott, Everton Blender, Junior Reid and Frankie Paul. On the festival circuit, the Reggae Angels recently did Reggae on the River, The Victoria Ska fest, The Northwest World Reggaefest, The Slow Music Fest, The Monterey Reggaefest, Dreadstock, and the Rocktober Festivals in Hawaii. It’s been a busy schedule. They have toured consistently since the mid-90’s, bringing their spiritually uplifting message to the people. They are well loved and appreciated. Lyrically their music guides toward good character, affirming qualities such as generosity, balance and gratitude. The Reggae Angels have one of the most extensive discographies of any American Reggae band. Their 10th release – Make Blessings – on the Explorer Recordings label- is available worldwide. They now have an 11th release out called Prophetic Mission. Their music is food for universal righteousness. For bookings contact Peter Wardle with Kings Music International at (510) 326-8445 or online at reggaeangl@aol.com. To date, Jamaican-born singer Junior Reid, a devout Rastafarian regarded by many as a messenger from Jah, is best known for the hit singles ‘Foreign Mind’, ‘One Blood’, ‘Boom Shak-a-Lak’ and ‘Listen to the Voices’. He also served as the lead singer for the Grammy Award-winning Reggae group Black Uhuru. district of West Kingston. Junior began his career at an early age, gaining his initial inspiration from a tough upbringing. He recorded his first single ‘Know Myself’ at age fourteen for the late singer Hugh Mundell, released in the U.K. on the Greensleeves label. He then went on to form his own band, The Voice of Progress, and after a local hit with ‘Minibus Driver’ the group’s success was established with the album of the same name. At the age of eighteen, Junior was asked to join Black Uhuru as lead singer. The group completed their transformation to international status while he was a member, nominated twice for a Grammy Award in the Reggae category. After many changes in the music business and an agreed separation among the members of Black Uhuru, Junior returned to the solo arena and started his own production company, J.R. Productions. Once again a solo artist, he recorded a number of songs for J.R. Productions and Sugar Minott’s Youth Promotion label, enjoying considerable popularity with tracks such as ‘Human Nature’, ‘A-1 Lover, ‘Uplifting’ and ‘Proud Statement’. 1988 saw the release of Junior’s first solo album, One Blood. The ‘One Blood’ single was remixed by Paul “Trouble” Anderson and released worldwide on Big Life/Mercury Records. That track and ‘Long Road’ received nominations for the prestigious Caribbean Music Awards and the Jamaica Music Industry Awards. He won awards for Best Album, Best Single, Best Song and Most Conscious Lyrics at the Jamaica Music Industry Awards. The follow-up to One Blood was the album Visa, which was distributed by the Greensleeves and Ras labels in addition to his J.R. Productions label. During his music career Junior Reid has performed around the globe from Bermuda to Japan. He has proven to be a durable and popular entertainer on the world stage. In 1993, after a winning performance in Jamaica at the Montego Bay Superfest he toured Europe alongside Sugar Minott, the 809 Band, and Dub poet Mutabaruka. Junior was also featured in the biggest one-night show in Jamaica, the Sting, from 1996 to ‘98. Following exceptional performances at Sting and other shows he was offered a starring role in the Jamaican film ‘Klash’, produced by Billy Parker. In 1997 Junior produced the album True World Order. He performed on the True World Order Tour in the United States and United Kingdom. He also teamed up with Busta Rhymes and Bounty Killa to record the hit single ‘Change Like the Weather’. He recorded the single ‘Dreadful Day’ with rappers Poor Righteous Teachers and, joined by the artist Cannibus, recorded the song ‘Frounsi Sound Bwoy’ for the Universal label. and newspapers and performed extensively internationally. In a producing role, Junior has lent his talents to various other artists. Early on he worked with Dennis Brown, Gregory lsaacs and the Mighty Diamonds to name few. More recently he has produced Andrew & ‘Wada Blood (his sons), Elephant Man, Delly Ranks, Luciano and Anthony B. Reid has worked closely with Rap artists such as Wu Tang Clan, Goroo from Gangstar, the Absolute Beginners (from Germany) and Cold Cut. In the year 2000 Mr. Reid/J.R. Productions distributed the ‘Emanuel Calling’ album, featuring the songs ‘Mashing Up the Earth’, ‘John Law’ and ‘Trod Up A-Zion’. He toured the United States and Caribbean, garnering raves. In 2002 Rasta Government was released. Lost Vinyl Classics was released in 2005. Junior has a new album finished, soon to be released. With his incisive, prophetic lyrics and unstinting support for the ghetto man, Junior remains a powerful roots artist well known and loved worldwide. Currently based in the San Francisco, Calif. East Bay, the Reggae Angels have been touring the last decade in the U.S., Hawaii, Canada and South America. They are well loved and respected. They’ve taken the message to many different places. 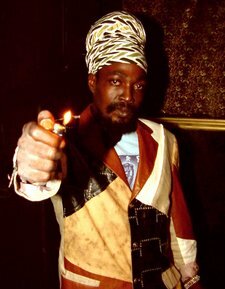 Top international artists have had the Reggae Angels back them, including Don Carlos, Horace Andy, Michael Rose, Big Youth, The Abyssinians, Edi Fitzroy, Bernard Collins, Carlton & The Shoes, Junior Murvin, Clinton Fearon, Everton Blender, Sugar Minott, Andrew Tosh, Shinehead, Junior Reid and Frankie Paul. The band has consistently met the needs of world-class performers, touring with them to the far reaches. The Reggae Angels vocalists are Fenton Wardle and Cynthia Roots. Lead vocalist and bandleader Fenton Wardle started playing for the public at the age of twelve, playing his accordion in the streets in San Francisco. In 1982 Fenton fronted his first band Ily in New Hampshire, where he attended Dartmouth and graduated in 1984. In 1986 he formed a band on the West Coast called The Chosen Few. In 1989 the band re-grouped as The Elevations. Fenton sang lead and harmony vocals and played keyboards. With the Elevations, he produced two albums- Jah Guide and Good Judgment. In 1992 Fenton left the Elevations and started the Reggae Angels. For his Reggae Angels unit, Fenton has produced Guard the Honor, Jealousy, Truth and Conviction, Spirit, Signs and Wonders, Which Road Will You Choose, Live Positive,Come To Jah, Save Our Souls, A Heart With Love, Balance and Make Blessings. Augustus Pablo is featured playing melodica and synthesizer on the earlier works, adding his melodious far eastern sound. The early mixing was done in Jamaica with some of the top engineers including Sylvan Morris, David Rowe, Soljie, Dr. Marshall and Hugh Palmer. Scientist mixed the next four CDs in Los Angeles and the San Francisco Bay Area. Balance, Make Blessings and Prophetic Mission were mixed at Lion and Fox recording studios, in Alexandria, Virginia by Jim Fox. The Reggae Angels have one of the most prolific catalogues of any American based reggae band, including 11 CDs and numerous dubs. Fans of reggae know The Reggae Angels deliver high-energy performances with a happy, uplifting sound and sincere message. Their music speaks of God consciousness. Their lyrics contain spiritual insights and teachings — the message. All different ages and kinds of people love and appreciate the Reggae Angels, especially the spiritually inclined. Their focus is on clarifying the message of the prophets — advice and prayers to bring us nearer to God. The Reggae Angels have their own recording studio in Oakland, California called The Workshop, where they help produce other artists as well as their own works. See the website www.ReggaeAngels.com for music samples and their upcoming show schedule.